Ginny beams after accepting the Distinguished Staff Award. 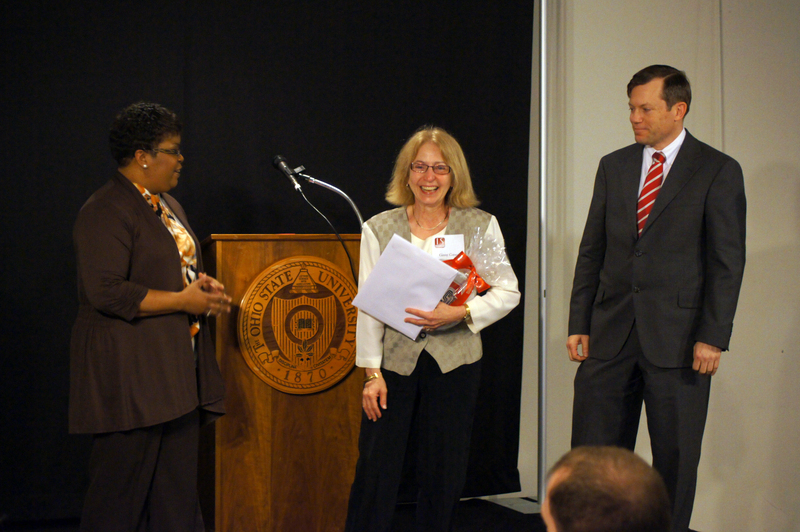 Virginia “Ginny” Corso, Academic Advisor for Education, Academy, and Seniors to Sophomores programs at The Ohio State University at Mansfield, has been named a 2013 recipient of the Ohio State Distinguished Staff Award. In her 32 years with the university, Ginny has consistently identified and helped develop innovative programs to maximize new opportunities on the Mansfield Campus. Her efforts led directly to the hiring of the first fulltime Disability Specialist on campus, creation of Mansfield Staff Advisory Council, establishment of Seniors to Sophomores program, and development of educational articulation agreements, helping North Central State College early childhood education associate degree graduates transfer more easily to Ohio State Mansfield. Corso earned her Master of Education from Kent State University and Bachelor of Science in Education from Indiana University of Pennsylvania. She earned her Mathematics Certification from The Ohio State University, and teaches college math and freshman orientation classes at Ohio State Mansfield. The Distinguished Staff Award recognizes just 12 staff members university-wide who have had five years of continuous service, for exceptional accomplishments, leadership, and service to the university community by significantly improving or enhancing the quality of work life in ways that make a substantial difference for their colleagues; contributing to outstanding and sustained improvements in customer services; and developing creative solutions to problems that result in significantly more effective and efficient university operations. The Office of Human Resources awards honorees a $1,500 cash award and a $700 increase to their base salary.